Proper calf barn ventilation is more than just having fans in the barn. Crystal Creek® has the equipment and expertise to bring creative, effective calf barn ventilation solutions to any calf raising operation. 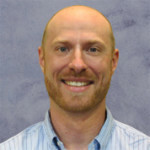 Dr. Ryan Leiterman is a dairy veterinarian experienced in calf barn air circulation design and analysis. He holds degrees in both Agricultural Engineering and Veterinary Medicine. During his time in practice, Dr. Leiterman experienced first-hand how a properly designed ventilation system could improve calf health and calf raising profitability. He has worked with both new construction and retrofitted existing buildings to improve respiratory health. 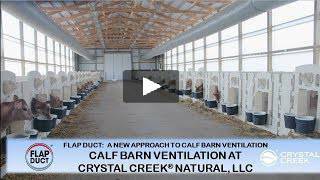 This video explains the philosophy behind our calf barn air circulation systems and how Crystal Creek® believes there is “no such thing as too much fresh air”. There is a fundamental shift in how calves are being raised. 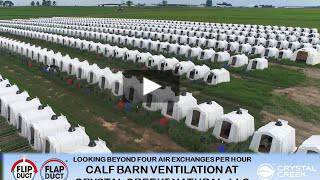 See how the FLAP DUCT ventilation system can benefit your calf raising operation: FLAP DUCT A New Approach to Calf Barn Air Circulation. The Crystal Creek® approach to calf barn air circulation challenges the long standing belief that calf barns should limit ventilation in the winter to 4 air exchanges per hour. An overview of how you can put the most innovative calf barn air circulation system currently available to work in your calf barn. Each ventilation system is CUSTOM DESIGNED to your barn and pen layout. 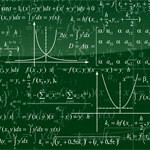 See why even our most basic designs are more advanced than our competitors or read about commonly asked questions. BUILDING A NEW CALF BARN? Before pouring concrete, learn about proven, useful ideas that will save you money and create a calf barn with better air quality! This revolutionary design is the biggest thing to hit calf barn ventilation in the last 10 years. Finally, a single duct system that works in ALL SEASONS! 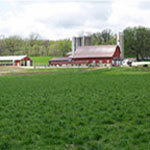 See why this patented technology is so amazing and how it can work on your farm. The industry’s most innovative system delivering an unmatched level of control. FLAP DUCT builds on the versatility of FLIP DUCT, featuring an internal membrane that can be air tight, perforated, layered and segmented based on seasonal need. This tutorial provides both video and downloadable PDF instructions that have simple, step by step directions on how to set your system’s variable speed controller. Watch it on your smart phone while in the barn setting the controller, or print off the instructions and keep them in the calf barn for reference. These fabric ducts are versatile. We can do everything from single ducts designed for multi-season use, advanced calf barn ventilation design calculations, and directional nozzles to unique shapes requiring 90 degree elbows, 45’s, Tees, logo applications and more… you name it, we can do it!